“No religion condones the killing of innocents.” — U.S. President Barack Obama, September 10, 2014. “Islam is a religion of peace.” — U.K. Prime Minister David Cameron, September 13, 2014. “There is a place for violence in Islam. There is a place for jihad in Islam.” — U.K. Imam Anjem Choudary, CBN News, April 5, 2010. Regrettably it is impossible to re-interpret the Qur’an in a “moderate” manner. The most famous modern interpretation by Sayyid Qutb (d. 1966), the Muslim Brotherhood ideologue, leads the reader again and again into political territory, where jihad is at the root of action. If they deviated from the true faith — as we are seeing in the Islamic State today — “backsliders,” like pagans, were to be fought until they either accepted Islam or were killed. In India alone, between 60 and 80 million Hindus may have been put to death by Muslim armies between the years 1000-1525. It is not just Muslims who say that Islam is a religion of peace: some Western politicians and churchmen repeat it too. Britain’s Prime Minister, David Cameron, emphasized it last week on BBC on Sept 13, in response to the beheading by ISIS of the British aid worker, David Haines. Former U.S. President George W. Bush said so more than once, including in a speech he delivered on September 17, 2001. Choudary is right. Although the Arabic word for peace, salam and the word for submission (islam) come from the same three-consonant root, they have quite distinct meanings and come from different forms of the verb. No-one who knows Arabic could mistake one word for another. Islam does not mean “peace.” Islam means “submission.” Its root, salam, means peace, but not in the Western sense of the word. It means the peace that will prevail in the world once mankind converts to Islam, although which branch of Islam is apparently still in dispute. What is curious is that no-one, so far as I know, has placed much or any emphasis on the earliest history of Islam. By any measure, this early history sadly demonstrates that Islam has never been a religion of peace and that modern jihadists, especially Salafis, take their inspiration directly from the actions of the first three generations of the faith, the Salaf (forefathers), the companions of the prophet, their children and their grandchildren. What is, or should be, worrisome, is that these figures serve as constructive role models for Muslims today. Regrettably it is impossible to re-interpret the Qur’an in a “moderate” manner. The most famous modern tafsir, or interpretation, of the holy book is a multi-volume work entitled, In the Shade of the Qur’an. It was written by Sayyid Qutb (d. 1966), the Muslim Brotherhood ideologue often regarded as the father of modern radicalism. His interpretation leads the reader again and again into political territory, where jihad is at the root of action. The Qur’an contains many peaceful and tolerant verses, and these could well be used to create a genuine reformation — something several genuine reformers have tried to do. But there is a catch. All these moderate verses were written in the early phase of Muhammad’s career, when he lived in Mecca and had apparently decided to allure people. When he moved to Medina in 622, everything changed. He was soon a religious, political and military leader. During the next ten years, as his religious overtures were sometimes not welcomed, the peaceful verses gave way to the jihad verses and the intolerant diatribes against Jews, Christians and pagans. Almost all books of tafsir take for granted that the later verses abrogate the early ones. This means that the verses preaching love for all are no longer applicable, except with regard to one’s fellow Muslims. The verses that teach jihad, submission and related doctrines still form the basis for the approach of many Muslims to non-believers. One problem is that no one can change the Qur’an in any way. If the book contains the direct word of God, then the removal of even a tiny diacritical mark or a dot above or beneath a letter would be blasphemy of the most extreme kind. Any change would suggest that the text on earth did not match the tablet in heaven — the “Mother of the Book,” much as Mary is the Mother of Christ — that is the eternal original of the Qur’an. If one dot could be moved, perhaps others could be moved, and before long words could be substituted for other words. The Qur’an itself condemns Jews and Christians for having tampered with their own holy books, so that neither the Torah nor the Gospels may be regarded as the word of God. The Qur’an traps us by its sheer unchangeability. The besetting sin of modern Western politicians, church leaders, and multiculturalists is their ready acceptance of ignorance and their promotion of their own ignorance to the rank of expertise. Islam is one of the most important topics in human history, but how many schoolchildren are given details such as the ones mentioned above in their history classes? How many textbooks paint an honest picture of how Islam began and how it continued as a background to how it continues today? Furthermore, how many real experts are denied contact with government and politicians so that lies are not made the basis for governmental decisions in the West? How many times will truth be sacrificed to fable while Muslim extremists bomb and shoot and behead their way to power? These facts do not come from modern Western accounts; they are there in the founding texts of Islam, in the histories of al-Waqidi and al-Tabari. No-one is making any of this up. Muslims who avoid their own history should be brought face to face with it in all future discussions. Unfortunately, even many moderate Muslims still fail to see the reality behind some of the most elementary aspects of their own religion. Just after the 7/7 bombings in London, in July 2005, the Guardian newspaper asked several people for their views on the attacks. One, an amiable young Muslim leader, said he had been horrified by the murders committed by four of his co-religionists. He said that if only young Muslims were to read the Qur’an, they would back away from all forms of violent extremism. All the world’s jihadi fighters constantly read and quote from the Qur’an, where they find more than enough justification for violent assaults on non-Muslims, apostates and “hypocrites” (munafiqun — a word taken straight from the Qur’an, meaning something similar to backsliders). Apart from the Qur’an, the six books of Hadith and the biography of the prophet (the Sira) represent a world born of violence. 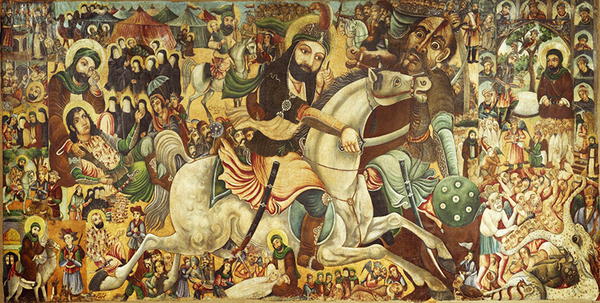 Muhammad, after taking up residence in Medina, led his followers into battles and on raids into tribal areas. He fought in major conflicts like the battles of Badr, Uhud, and al-Khandaq. Ibn Ishaq, his biographer, says he fought in twenty-seven battles. In addition, he sent out lieutenants to raid caravans — raids are known asghazwat. About 100 such raids took place, primarily to call Arabs to Islam. If they deviated from the true faith — as we are seeing in the Islamic State today – backsliders, like pagans, were to be fought until they either accepted Islam or were killed. Muhammad died in 632, and was to be succeeded either by his father-in-law Abu Bakr (d. 634), regarded by Sunnis as the first Caliph, or by his son-in-law ‘Ali, regarded by Shi’is as the first of the twelve Imams — thus placing the main split between Sunnis and Shi’is in Islam within days of Muhammad’s death. The first undertaking on which Abu Bakr embarked as Caliph was to launch a series of attacks across the Arabian Peninsula. The Bedouin tribes, who had followed their custom of withholding allegiance once the leader of an associated tribe died, apparently believed their fealty to Islam had ended when Muhammad departed this world. Abu Bakr treated this as apostasy and sent out cohorts to force the tribesmen back into the fold of Islam. These Wars of the Ridda resulted in fifteen battles. Once this had been settled, Abu Bakr sent Muslim armies out to conquer Iraq (a province of the Persian Sasanid Empire) and the Levant (part of the Christian Byzantine Empire). When Abu Bakr, an old man, died of fever in August 634, he was succeeded by ‘Umar ibn al-Khattab (d. 644). Under his rule, the entire Sasanid Empire and two-thirds of the Byzantine Empire were conquered for Islam. Battle followed battle, bloodshed came after bloodshed. In 644, a group of Persians, outraged by the conquest, conspired to kill ‘Umar and succeeded when a former slave best known as Abu Lu’lu’ assassinated him during prayers. Even though the third of the four “Rightly-Guided” Caliphs, ‘Uthman ibn ‘Affan (d. 656), was already 65 on his ascension, battles to conquer or bring into line half of the known world took place during his reign. His conquests stretched as far as modern-day Pakistan, Iran, Afghanistan, Azerbaijan, Dagestan, Turkmenistan and Armenia. Sicily and Cyprus were captured. Armies moved into North Africa, and later into the Iberian Peninsula and southern Italy. Towards the end of his life, however ‘Uthman became unpopular with many. Medina, where he had his capital, became a hotbed of intrigue and unrest. In 656, an armed revolt broke out, and 1000 rebels, with orders to assassinate the Caliph, headed from Egypt to Medina. Some entered his house and assassinated him, after which his supporters turned on them and fighting broke out. The religion of peace was still on the march. ‘Uthman was followed by Muhammad’s son-in-law, ‘Ali (d. 661), the last of the four Rashidun (Rightly-Guided) Caliphs. Almost immediately, ‘Ali was caught up in a quarrel that ended in civil war. He faced the prophet’s wife, A’isha, at the Battle of the Camel in 656, when reportedly 10,000 were killed. He also faced the forces of Mu’awiya (later the first of the Umayyad Caliphs) at Siffin (657), where ‘Ali lost 25,000 men and Mu’awiya 45,000. ‘Ali himself was assassinated in his capital of Kufa by a Muslim extremist during prayers in 661. The Umayyads took power and established their long-lived capital in Damascus. But violence swiftly followed. In 680, when Mu’awiya’s son Yazid (d. 683) assumed the Caliphate, a grandson of Muhammad, Husayn the son of ‘Ali, rebelled and raised forces to attack Yazid. The two sides met at Karbala in 680; in the fighting, Husayn, his family and his followers all perished. This marks the most crucial moment in the split between the Shi’a (for whom Husayn is the third of their Imams) and the Sunni majority. So long as the Qur’an is on the shelves of every mosque and Islamic bookstore, young men and women in theirthawbs and hijabs can find in it the perfect justification for their continuing endeavours in the path of jihad and the killing of innocents.The rest of Islamic history is marked by annual jihads, wars between different Muslim rulers and empires. In India alone, between sixty and eighty million Hindus may have been put to death during the centuries of invasions by Muslim armies from 1000 to 1525. Is this simply to be forgotten? The dot or nuqta is of enormous importance in Shi’ism, where the Imam ‘Ali asserted that he is the dot beneath the letter b at the very beginning of the first word of the Qur’an, bismillah, which makes him the first of all created beings. Sects such as the Nuqtavis and Babis in Iran have read deep meanings into this. It may be a dot, but it can mean the world. See William Montgomery Watt, Muhammad at Medina, pp. 208-216, Oxford, 1956, the definitive study of this period. The present writer was a student of Watt’s in the 1970s. K.S. Lal, Growth of Muslim Population of Medieval India (1000-1800).